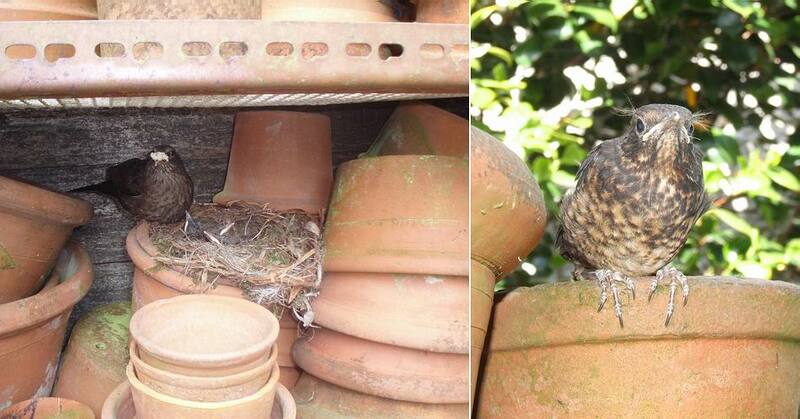 Regular readers of the bulb log will remember Dumpling the blackbird that nested in one of the bulb houses some years back. We have had many generations of blackbirds born and raised in our garden over the last thirty or more years we have been here; sometimes I curse them when they pull cushion plants apart or spread the mulch all over the paths but the garden would be a sad place without them. Here are a few of the latest generation to be hatched in the shelter of the clay pot store at the end of the seed beds. Ma feeds them up and the next day they are big enough to leave the nest - have you noticed there is always one that is reluctant to leave the comfortable surroundings of the nest. Talking of babies and off spring I cannot resist getting into some of the pots of bulbs that are now fully dormant to see what how they have grown over this season. Above this pot of Crocus niveus has increased so well that I have had to move it up from a 7cm to a 9cm pot. 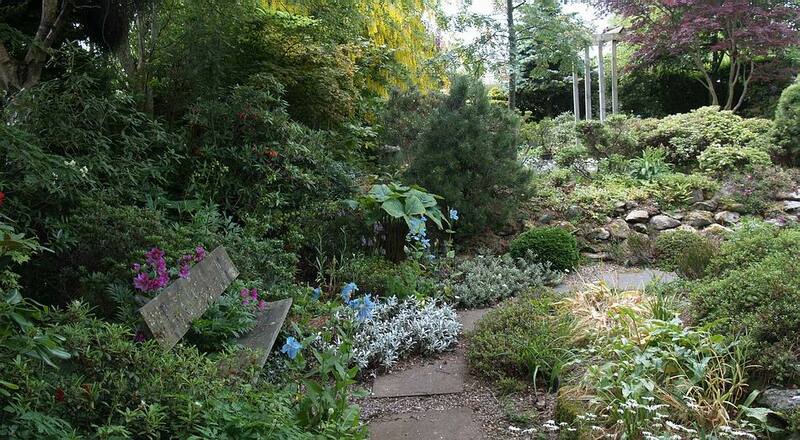 Many years ago when the late Harold Esslemont visited our garden he looked at our glass house packed full of plants - we had more alpines than bulbs under glass in those days - and wisely said that even if we just moved every plant up one pot size we would be in big trouble! Well nothing much has changed and now, even with three glass houses, juggling space and the need to rationalise is always an issue. Last year when I switched over completely to square plastic pots I found that I had a small area (a bit under a meter square of plunge) left at the end of the frit house which I planted with all the stray bulbs discovered in the sand plunges as I reorganised. Well now I am going to need that space for pots so all these bulbs, which I sorted out roughly into narcissus, crocus, frits large and small and others, are homeless again. I am sure that I am not the only one who finds that when you start a job in the garden it in turn leads you to another which leads to another and so on. I often finish the day doing a job far removed from the task I set out on which is still at an early stage - that is the knock on effect of gardening. So having to increase the size of the crocus pot meant I had to find space for it in the bulb house which in turn meant I had to move some of the frit pots that were there into the frit house which meant I needed that spare plunge space which meant I had to find somewhere for all those homeless bulbs which led me outside to the newest sand plunge that I built last year. 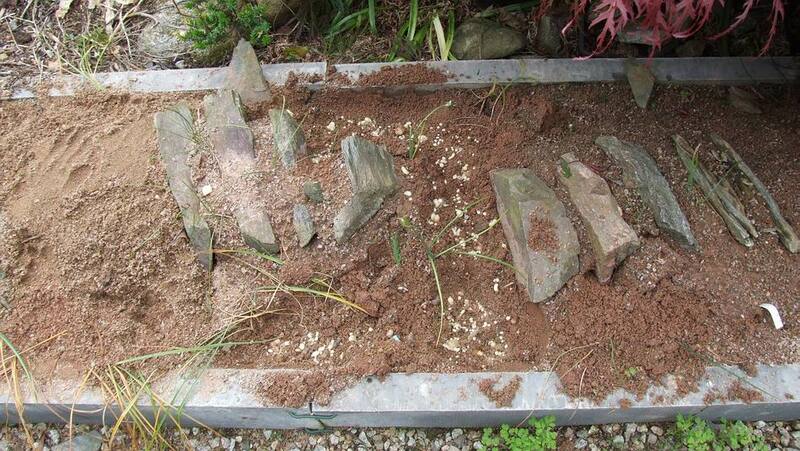 As this new open-air plunge was not very heavily planted up I decided to dig out all the areas except for the raised rocky areas that I have planted up quite well already. 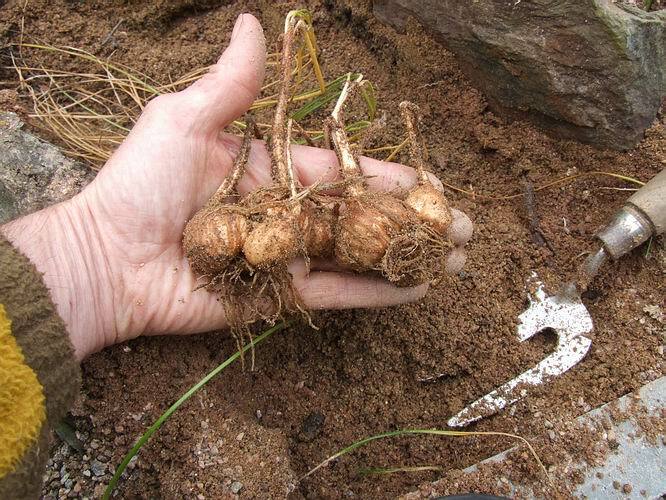 On digging I discovered that the Crocus sativus corms I had planted out last year had grown bigger than I have ever managed to get them in a pot. I have a very poor record at being able to flower this beautiful crocus so I the other year I researched how it is grown commercially and discovered to put it simply that it likes to be grown like a root crop - planted deep into rich moist compost. 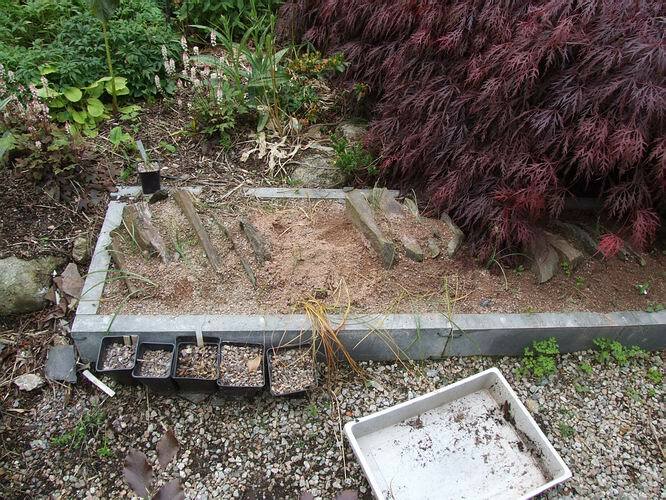 Obviously planting it deep below the ground level that the plunge bed was built on has worked in giving me large corms I will have to wait until the autumn to see if they will flower. I planted the bulbs by digging down areas of the plunge to a depth of around 7/8cms placing some of the bigger bulbs and scattering the small ones around in a random fashion. It will be interesting to see the results next spring - what survives to grow up to flowering size and what increases well. If this plunge is successful it will in turn cause another problem when it becomes over crowded and since I have just planted in excess of 1000 bulbs if you include the rice grains that may not be many years away. Away from the pots most of the spring bulbs in the garden are starting to retreat under ground now as their leaves first turn yellow and then wither away. I like to let this happen naturally and do not cut them off or tie them up to look neat and tidy - in case you have not noticed tidy is not an adjective that can be applied to me or my garden. 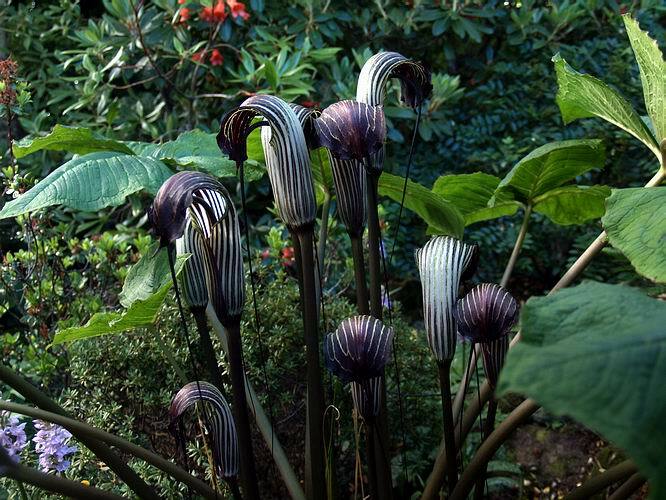 In the centre of the picture you can see the large leaves of a magnificent Arisaema. I have still not worked out exactly what species it is yet but it is a great plant increasing well each year. I lifted few bulbs two years ago and moved them to another area so we now have two clumps - to date it has never set viable seeds. 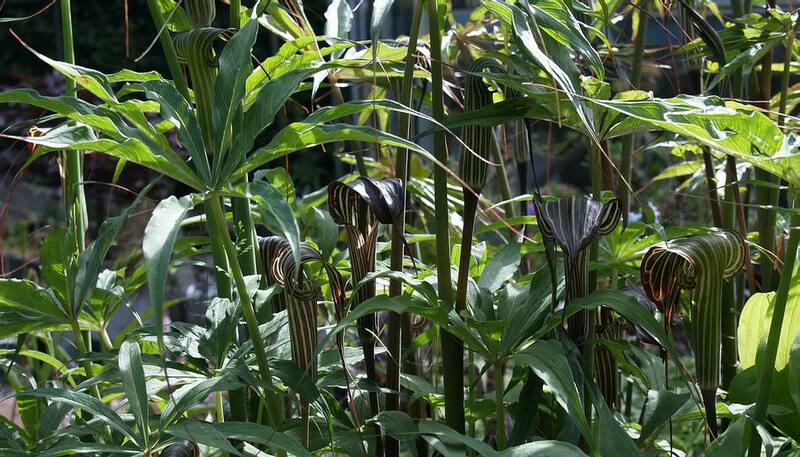 One of the easiest to grow I find is Arisaema ciliatum which is also very beautiful with lovely striped flowers and stylish leaves that end in long narrow threads. This species sets masses of seeds every year and I have often just let them fall to the ground so we have a positive jungle of stems forming. This species also sends out stolons so you get a line of plants radiating out from the original site. 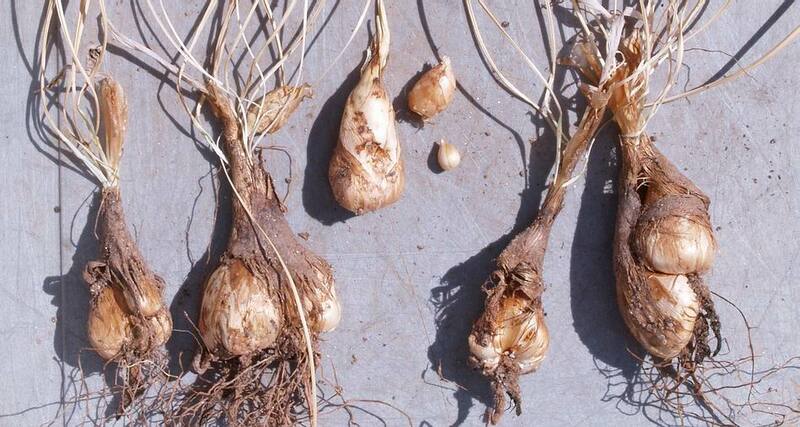 Unlike seedlings which would require light to germinate and grow to flowering size these mature bulbs forming at the end of stolons are able to appear up through a long established dwarf yew and up through the middle of a large clump of uvularia. 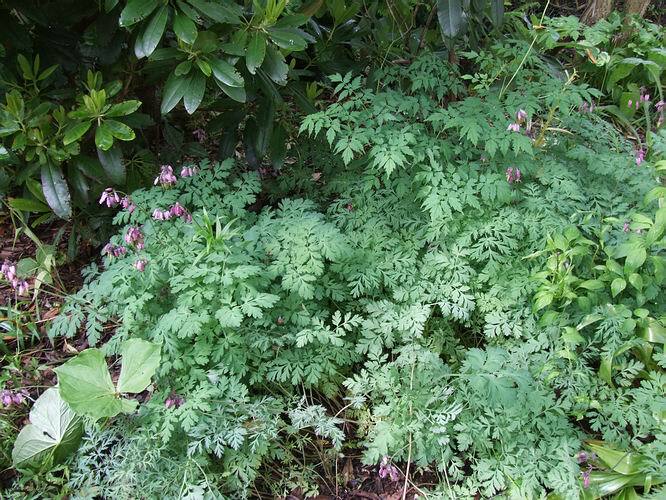 While on the subject of plants spreading by stolons, this brings me to another task I am working on and that is clearing and replanting a bed of bulbs where Dicentra formosa has taken over. 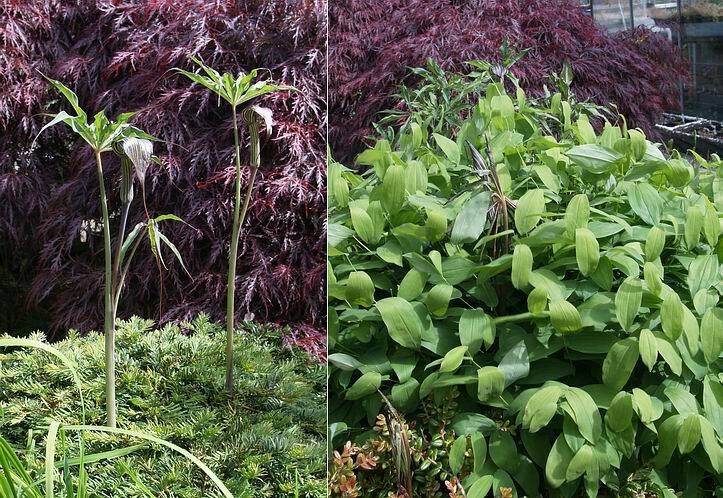 This plant can be very invasive if it enjoys your garden conditions and our humus-rich deeply mulched top soil seems to be the perfect place for it to spread and seed around. I originally planted the cultivar 'Stuart Boothman' also known as 'Boothmans Variety' which has delicate finely cut leaves and is not that invasive in itself. However it seeds around and the off spring produce a range of plants with the courser leaves of the species at one extreme and the finely cut leaves of 'Stuart Boothman', above right, on the other. 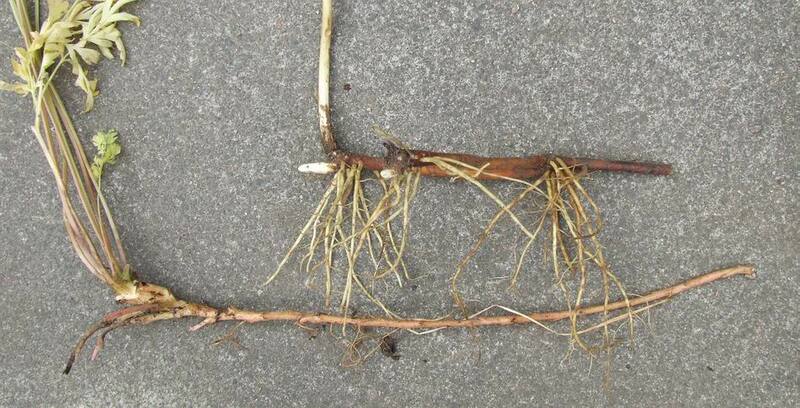 Fortunately it is relatively simple to remove the dicentra as its large spreading root system sits near the surface and by carefully pulling a plant you can lift a long line of roots up with it. Another plant that spreads by stolons is Podophyllum peltatum which just is starting to be a problem in another bed. Its pretty flowers are held below the leaves and you have to get low or use your hand to reveal their beauty. It is a funny world we gardeners inhabit where we are happy to see some plants increase as much as they can while we consider others to become a nuisance. 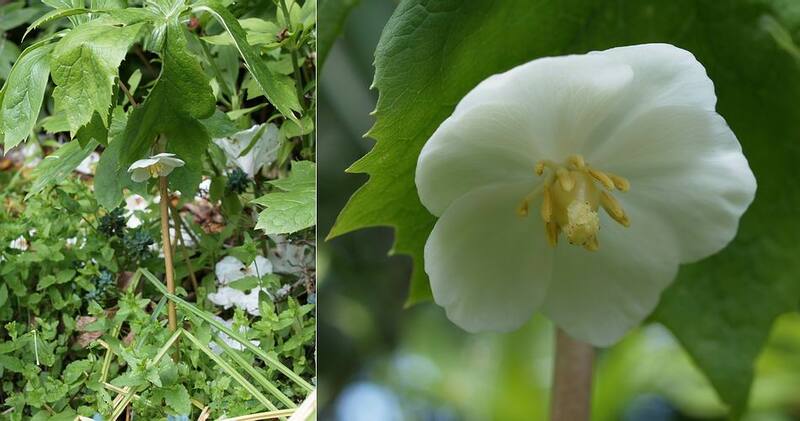 The truth is that natural habitat of both of theses plants is light woodland and so they have evolved a similar alternative strategy to expand their territory by stolons as well as by seed. If I had a nice large woodland I would be happy to give these plants free range however in a the finite space we have as our garden I must exercise control - I have always said there are no bad plants just bad gardeners. 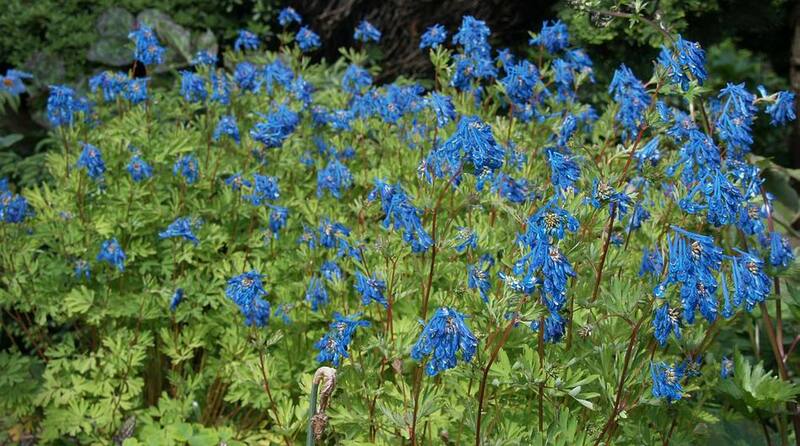 One plant I am happy to see spreading around is Corydalis x 'Craigton Blue' my hybrid between Corydails elata and flexuosa. As well as seeing it in many other gardens and offered by nurseries I have seen it in several award winning displays at major shows around the country and I cannot tell you how much pleasure that gives me. Apart from having great colour it is proving more adaptable to many gardens where the parent species do not do well - this clump by our front door not only looks great but it welcomes us with its delicious honey like scent.